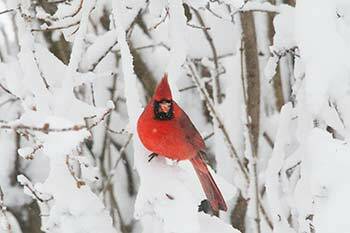 Winter time is great for bird watching. 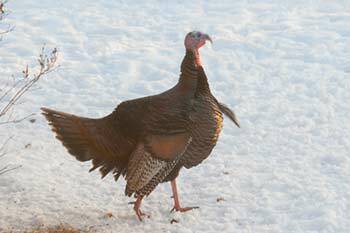 They are easier to see with no foliage and many birds tend to congregate in larger flocks. In summer they pair off. 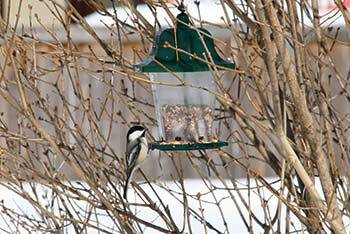 Many birds are attracted to the bird feeders, or to the birds that come to the feeders. Here is a selection. 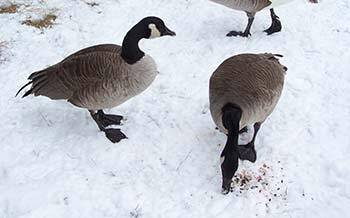 Canada Geese often migrate South but some seem to be willing to endure the cold weather if they can get food and some open water. Crows are fabulous clever birds. They have good memories too. 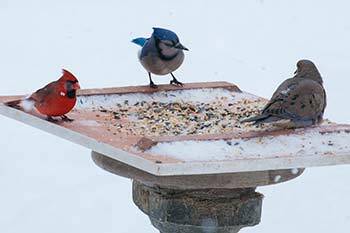 The same 3 birds have been visiting for several years. I put dog food out for them and they recognize my call. 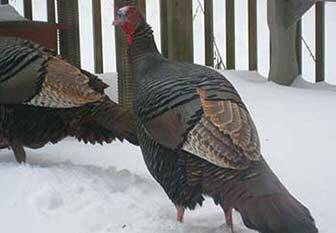 They will also come for regular bird seed. Here the crow is in the tree watching me put food down for them. 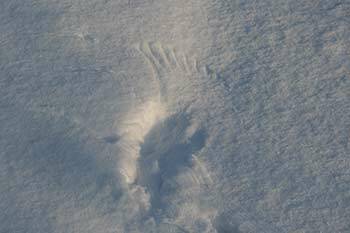 When they land in the snow there is a feather pattern. One afternoon brought high drama in the yard. During a snowstorm I noticed a dark spot in the yard. 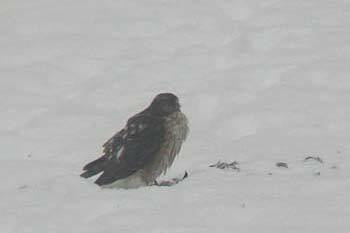 It was a Sharp Shanked Hawk eating a bird. At first he spent time just pulling out feathers but soon he was eating. 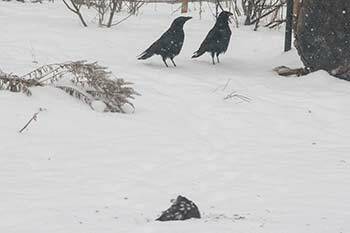 It didn't take long before 2 of my regular crows noticed and tried to bully the hawk away from his meal. 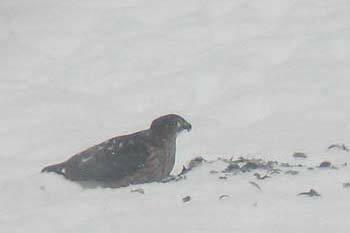 The hawk just sort of hankered down and kept eating. He kept an eye on the crows but did not give up the meal. The crows came very close but did not attack. 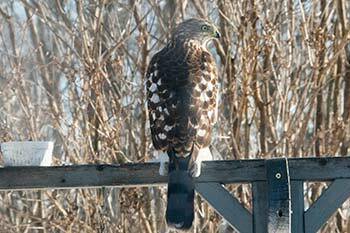 The next day the little hawk is back checking out the bird-feeder. 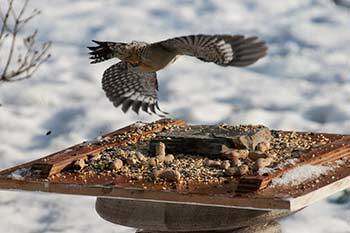 He swoops in very fast and often pushes the sparrows against the nearby house into the window screen where he crashes into them and gets his meal. 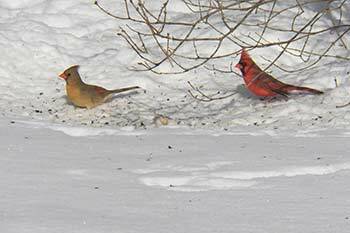 Most cardinals come with their mates. In winter there can be large flocks of them decorating the trees. In summer they split up the flock and the pairs go on to make their nests but come fall they congregate again with the grown babies following along. 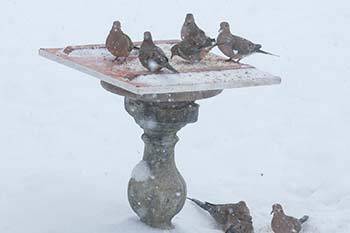 Pretty mourning doves in snowstorm comes in for a feed. They have a reputation for being gentle but in my feeder they chase away the blue jays so I think they hold up their end quite well. At this time of year I have a large flock that comes around. They seem to like corn unlike a lot of the other birds that go for the sunflower seeds. I get tremendous large flocks of sparrows coming to the feeders. 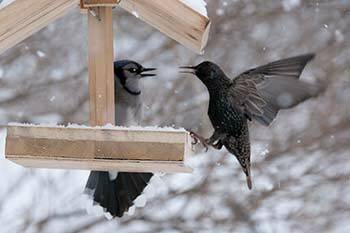 They squabble, throw seeds on the ground looking for their favourites, yell and make a tremendous noise. 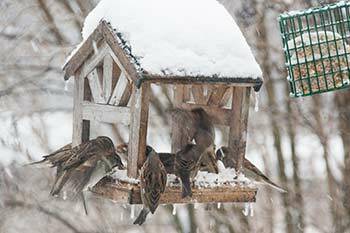 The flocks are mixed and often there are other little brown grey birds with the sparrows. I also get the visit of large flocks of starlings. They turn an attractive spotty colour in the winter. 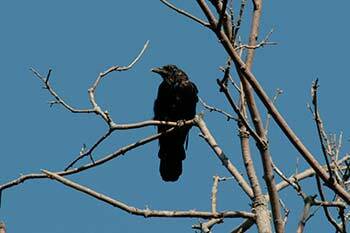 Later in the spring the starling flock will also have red wing blackbirds, cowbirds, and the gorgeous grackles with their iridescent blue heads and yellow eyes, but in the winter it's mostly just starlings. 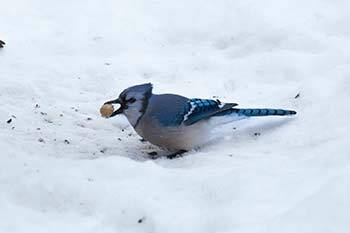 Blue jays come in packs, loud and pushy. They love peanuts and quickly land, focus on the prize then grab and run. If there is time they will pick up several peanuts and choose the heaviest. 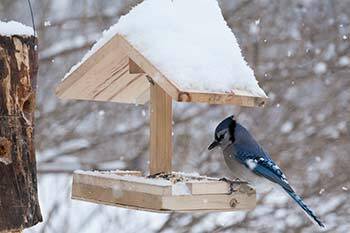 Blue jays have a really large store of squawks, squeaky hinge noises, do-it cries, alarm yells and soft clucks and chuckles. 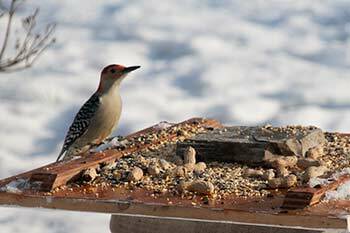 The red bellied wood peckers will come for suet but also for sunflowers and peanuts. They are one of the few birds that can chase a starling away. 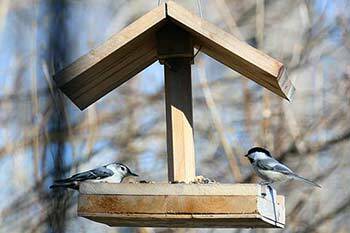 The little chickadees travel in mixed flocks often with tufted titmouses and nuthatches. 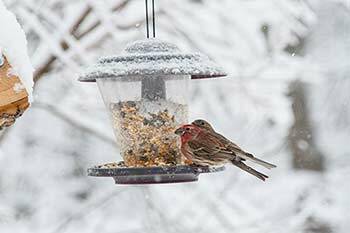 The house finches are often seen on the feeders along with the sparrows. 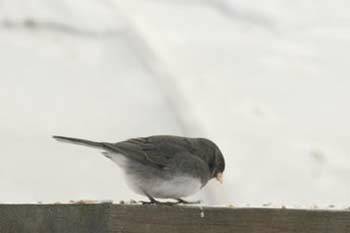 Dark eyed Juncos don't go to feeders much but prefer to forage on the ground. They might jump up on the banister or an the bench for seeds. In the late spring they will head north to nest. 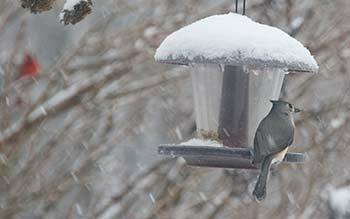 In the afternoon when the birds have eaten their fill the juncos, sparrows and other little birds will go into the bush and hang out and gossip. They will groom, and chatter happily for an hour. 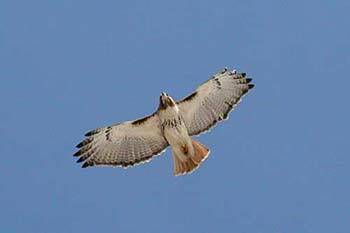 High in the sky soaring easily, the red tailed hawks and the turkey vultures watch for anything good to eat. If there are crows around they will try and attack the hawks and drive them away. 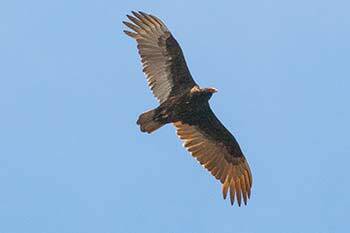 I live on a hill and the wind pattern create an updraft over my home so that the turkey vultures often just glide by. Just a short distance south of my home Lake Erie provides a steady supply of dead fish and the vultures can often be seen looking for lunch there. 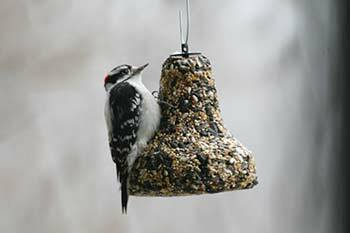 All through the winter I get visited by the downy woodpeckers and the larger hairy woodpeckers. They come for suet and peanut butter. 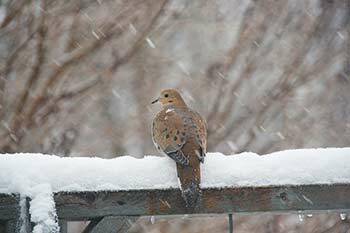 In late winter, the summer birds start coming back. 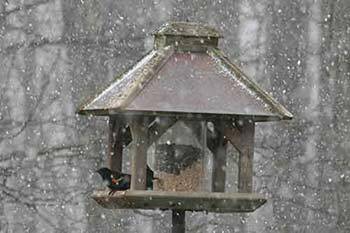 The male Red wing blackbird come before the ladies. They look odd in the snowstorms. I use a couple of field guides: The Audubon Society Field Guide To North American Birds: Eastern Region It has photographs of the birds, usually male and female and is small enough to carry around in your pack. My second book is: Birds of North America: A Guide To Field Identification (Golden Field Guide f/St. Martin's Press) It has drawings instead of photos. The drawings are useful because it is sometimes easier to see an idealized view of the birds showing all the characteristics that might not be seen in a photograph. 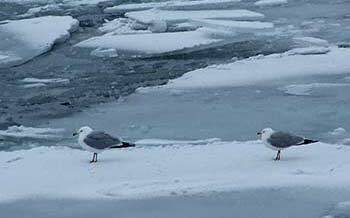 It can also even out local or seasonal variations and make it easier to recognize the birds. 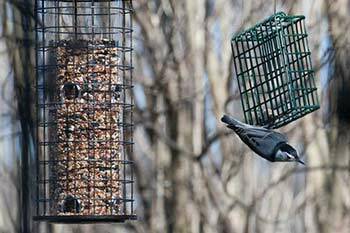 I have not had much luck with bird feeders that were enclosed in large mesh to keep big birds out. My small birds don't seem to like the idea of having to go into the meshed area. Squirrel and large bird proof. 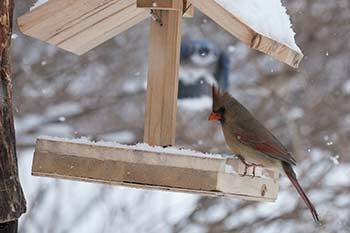 Cardinals and smaller birds are fine.